Masulipatnam or Machilipatnam as it is now known was once the first port of call on the Coromandel coast for European traders vying for a hold on India and it’s trade. This often overlooked-by-travellers town on the East Coast of South India makes for the perfect day trip destination from Vijayawada or even as an interesting detour for those heading to Vijayawada. Machilipatnam is a coastal town in the Krishna District of Andhra Pradesh. An ancient port town of the sixteenth century, Machilipatnam’s long rich history isn’t just about the trade. For it even finds mention in many Buddhist texts, for it is believed that the Buddha made his way to Amaravati – only a couple of hours away, via here. Though this once important port has faded away into insignificance it still boasts of flourishing trade. Only today, it is in the hugely popular Kalamkari fabric and gold plated costume jewellery (or imitation jewellery as it is more commonly known) used in Indian movies and television soaps. The Machilipatnam Beach tops of the list of points of interest in Machilipatnam. For this is a beach that is only a short road trip away from Hyderabad, which being in the land locked Telangana, doesn’t otherwise have quick access to the sea. It is also a black sand beach, yet another feature that sets the Machilipatnam – Manginapudi Beach apart. For there no other in the state. While Manginapudi in Machilipatnam has long been popular for its beach. It is only in the last few decades that Manginapudi has grown in prominence, owing to be being adopted by Datta Peetham led by Sri Ganapathi Sachidananda Swamy. He christened Manginapudi as Datta Rameshwaram, declaring it be a holy site equivalent to the major pilgrimage centre of Rameshwaram, after building a temple dedicated to Dattatreya Swamy. Since, then Manginapudi has also attracting tourists who wish to take a dip in the sea, visit the the temple on the coast and the twelve wells that were also built by the Peetham to defend the town from destructive tidal waves. A trip to this port from where the East India Company conducted its trade should prove to be interesting. Instead of a huge fleet of ships that once docked here, you will now find colourful fishing boats crowding the waters. A more welcome sight surely? Work is set to begin on developing an all weather deep water port here, at this long forgotten harbour. Though neglected as with everything else here in Machilipatnam, the sprawling Bandar Fort which was built by the Dutch in the 17th century, with its white washed walls and tiled roofs is reminiscent of Reis Magus in Goa. It is surprisingly good looking! The fort is a living testimony to the maritime trade history of the region. For it has been home to a hospital, a customs office, storehouses and godowns, an armoury and a textile factory even at different times in the last few centuries. The Chilakalapudi Panduranga Swamy Temple built by Sree Narasimham in 1927 is a beautiful symphony of colours and symmetries. 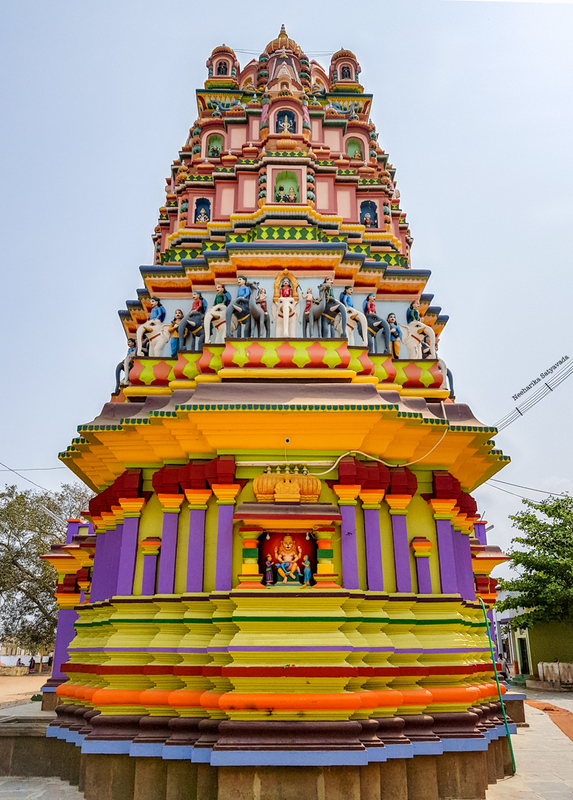 So strikingly is the main temple – dedicated to Panduranga Swamy and his wife Goddess Rukmini – painted in alternating hues of bright and vivid colours, that is bound to grab your attention from the moment you set foot on the sprawling temple grounds. What is even more fascinating about this temple though, is that, there is no Hundi (a donation box that is a common feature of temples) here and anyone who comes to this place of worship need not pay anything for puja performed here. The temple is still maintained privately by the original builder’s grand son, Sree Gangadharam. He is also the head priest of the main temple. Tiny temples in hidden alcoves dot the entire length of the complex and there is also the remarkable Sahasra Linga Mahamandapam with its many Shiva Lingams. Chilakalapudi is also famous for being a hub for rolled gold jewellery. Pedana is where everybody’s favourite fabric, Kalamkari comes from. Machilipatnam and Sri Kalahasti are the two main centres in the country for production of this artisanal fabric. But, Machilipatnam, has today moved onto screen printing, to quickly produce Kalamkari designs on both cotton and silk fabric to meet the growing demand – for fabric that has the Kalamkari design but not the price tag that comes with it. Very efficiently putting to use its long history of textile trading – that dates as far back as trading with the Greeks in Muslin – in commercialising this traditional form of art. Don’t forget to bring back a box of the sumptuous Bandar Laddu, which gets it name from the place it comes from – Bandar, which is but Persian for Port, and one of the names given to the port town of Machilipatnam. One can get to Machilipatnam either via Hyderabad or Vijayawada. Both of which are major cities in Telangana and Andhra Pradesh well connected by air, rail and road.